Well, March just absolutely flew by - did anyone else see it? So many amazing things are happening on the farm that it’s hard to know where to start - I’ll just start with the good stuff. We are trying to do lots more “fancy” flowers this year, so we have anemones and ranunculus in the hoop house right now, plus plenty more fun things, below. I ordered way more ranunculus than I meant to, so we will have a big glut rather than a little trial (I’m not complaining). We soaked and pre-sprouted our corms for both of these flowers, using Bare Mtn Farm’s bubbler technique, and germination is excellent. (If you haven't discovered Bare Mtn Farm's amazing blog and videos yet, you are WELCOME). 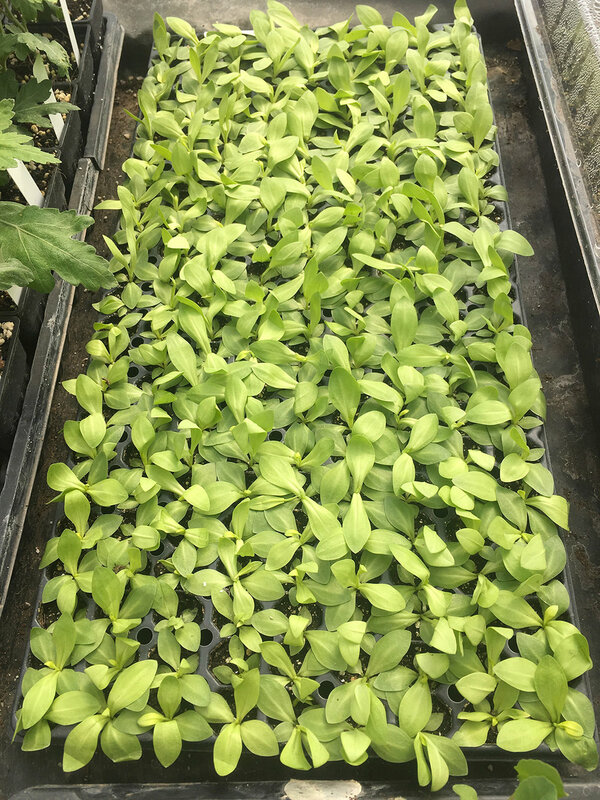 We planted the babies at 6x6 spacing in the hoop house after adding all-purpose granular fertilizer to the beds, and will be spraying them with compost tea and fish emulsion every 2 weeks. To space them, I use my homemade planting board, just plywood and dowels, to make perfectly spaced marks in the bed. We mulched the corms with oat straw, to help keep the soil temperature down, because our March was incredibly and unseasonably warm, to the point that I thought we might start seeing the ocean approach our doorstep! J/k we are so landlocked I think we’re safe unless ALL the ice caps melt tomorrow. The oat straw, unfortunately, still had viable seed in it, so I do have to do some weeding. Next year, we may go for white on black plastic instead. I planted my anemone and ranunculus a lot later than most growers, which is scary because they could get too hot, but I did it because I simply don’t have a wholesale buyer right now, and I really want them for May & early June weddings. 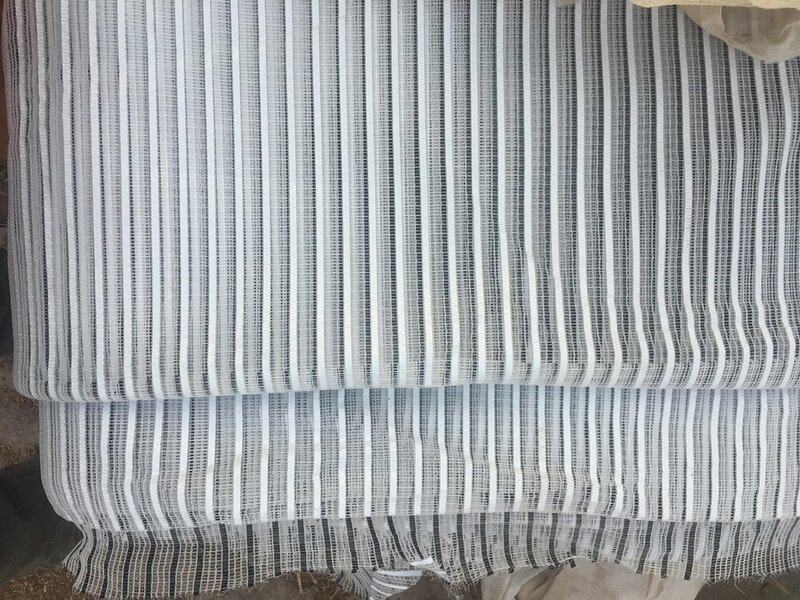 So, I also bought a really fancy shade cloth for our hoop house, which is supposed to be highly reflective on the outside and keep heat in at night. It’s called “Solara” and I got it from Farmtek. That will be an adventure to install! Anemone: Galilee Mix, Marianne Panda, Marianne Pure White (all from Gloeckner), and De Caen Mix (from Swart & Co., my boyfriend’s family business - they have a really addictive website, go check it out!). Ranunculus La Belle: Champagne, Pastel Mix, Scarlet, and Violet. Ranunculus Amandine: Black, Cream, Orange, Pastel Lemon, Pastel Pink, and Rose. My 6x6 planting board, making those perfect holes. Trigonometry, yo! Also, weeds. Popping up like lil trees! Deep in the heart of winter, I ordered way, way, way too many dahlia tubers, to stave off crippling depression. In March, most of them arrived, and I’d open a box to find that I’d completely forgotten that I’d ordered this variety from this company! Terrifying - I think we are going to have no room for anything but dahlias (again, not complaining). I store my dahlias in my flower cooler over the winter, with a space heater on a thermostat that will prevent them from freezing if it gets too cold. For wedding and design work, there is no better workhorse in our garden than dahlias, so I want them all the time. This year, to give myself more dahlias, I’m starting a few early in crates under my benches. I just lined my harvest crates with newspaper, filled with potting soil or peat moss, and moistened them a bit. They start putting out shoots much faster if I have them on a heat mat. I have a few precious varieties that I only have a few of - those, I’ll take cuttings from, so I plant them upright, with their necks sticking out of the soil , so I can get a good clean cut when the time comes. More about propagation in another blog! By doing this, I’ll have 8-week-old plants to put in the field by last frost, instead of just-waking-up tubers. I’m super, super thrilled about this, because it means we’ll have all those fluffy, dramatic, perfect blooms even earlier. I’d list the varieties I’m growing, but that would be insane. Oh, I also bought tuberose from Sunny Meadows Flower Farm. What’s wrong with me?!?! I have no idea how to grow tuberose! Under the benches, the tubers still get lots of light! It will be our first year growing these creatures. Well, ok, our second year, because the first year I tried them from seed and was completely bamboozled. They were the absolute tiniest seedlings I’ve ever seen, and they appeared to grow NOT AT ALL, not to mention the bad germination. So this year I took everyone’s advice and bought plugs from Gro-N-Sell through Gloeckner. (By the way, Farmer Bailey of Ardelia Farm is selling plugs!! I’m so excited and he has all the amazing varieties - check it out!) It was so exciting to get these plants in the mail - they came in this insulated box, with special cardboard spacers between each flat (3 flats to a box). I got 630 plants - eek! But they are all really good looking seedlings and they cost me about $160. Pretty worth it if I get the growing right. We’ll be planting them next week and pray that it doesn’t get too hot. 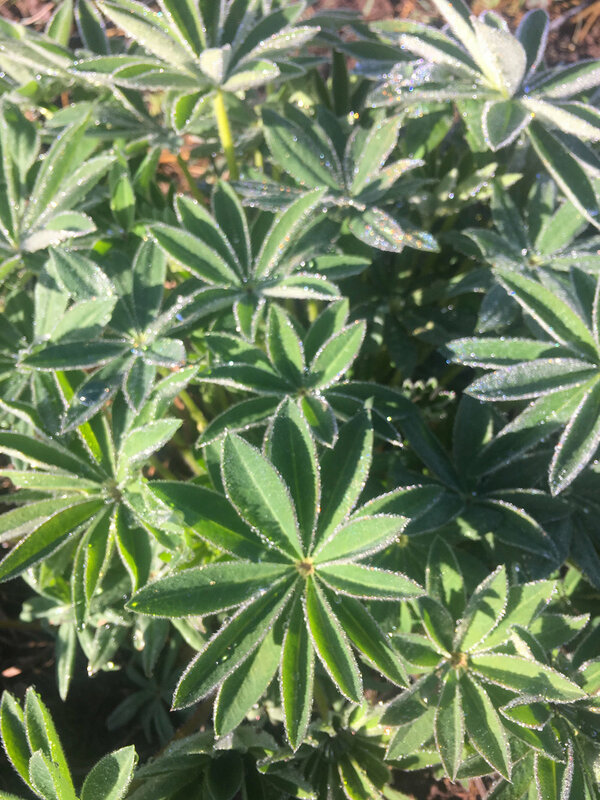 Specialty Cut Flowers, by Armitage & Laushman (AKA the flower bible), says that they will bloom great as long as they have 4-5 leaf pairs before being exposed to temperatures above 70°. Most of my plugs do have that many, so I’m hopeful that the hot hoop will be OK for them. I’ll let you know how it goes! Woohooo, mums!! I have no idea if these will bloom in time for me to harvest them & use them for weddings, but I HAD to try. I bought 2 each of 11 different varieties from King’s Mums. They cost me about $100 including shipping. I may or may not take cuttings, depending on what space in my hoop looks like. Of course, I could try them in the field as well - anyone out there doing mums outside? Mainly worried about frost before they bloom. It was also super fun to get the mums in the mail - there’s something amazing about opening a box to find a living thing inside. I put them into 2 inch pots immediately, and they seem to love our little nursery. Mocha (Meant to get Moira, oops), Moonbeam, Savanna Charlton, Norton Vic, Lynn Johnson, Alexis, Seaton’s J’Dore, Coral Charm, Apricot Courtier, Apricot Alexis, and River City. It’s my first year really going for it with hardy annuals in the early spring, following the sage directions of Lisa Mason Ziegler in her book Cool Flowers. For me, the most useful of these species are the greenery, like cerinthe, bells of Ireland, and bupleurum, plus really special flowers like sweet peas, stock, and Icelandic poppies. Unfortunately, I had really bad germ on both my first rounds of poppies (the Colibri poppies I got through Henk Onings, incredibly expensive at $75/1000 seeds!). My third round I seeded after keeping the seed at least a month in the freezer, then setting them on top of mini soil blocks, no heat mat, and with a humidity dome. This worked MUCH better and I’m hopeful for those guys. It just means I probably won’t be getting the big beefy stems I could have if I’d had them out in the ground by now. I’m actually really liking soil blocks for a lot of difficult-to-germ seeds. For some reason, they just seem to like it better! 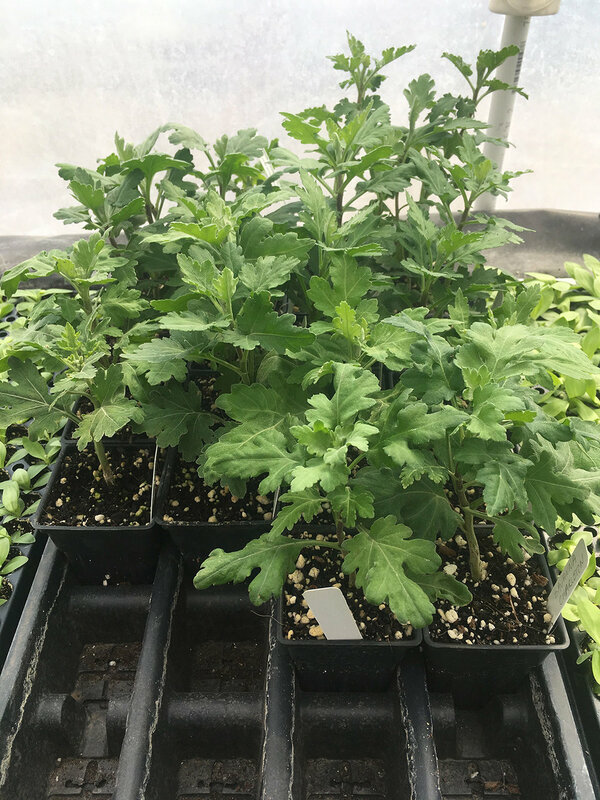 We transplanted a big round of hardies to the field on equinox, March 20th, which also happens to be about 8 weeks before our last frost - very auspicious! So far, they’ve done really, really well in the cool (and HOT) weather of March. Last night they had their first major freeze, with a low of 20° on top of about an inch of snow. They were protected by frost blankets, and I let the snow settle on top of the blankets to insulate further. The blankets were really weighed down by the heavy, wet snow, but almost none of the plants suffered any damage. I’m hoping that’s the last of the major freezes. One neat thing we did with our frost cloths was to add another support hoop on top of the first, which helps keep the cloth taut and keeps them nice and neat, too. This trick is thanks to Mimõ Davis of Urban Buds farm. For our sweet peas, which were already planted around their trellis, we used binder clips to hold the row cover to the trellis and kind of made a tent over the plants. Does anyone have a better solution for this? It’s kind of a pain. I have really high hopes for my cool flowers this spring! They’ll help us bridge that gap between early spring flowers and the big flush of summer blooms. Sweet peas going in the ground on Equinox! Binder clips to the sweet peas' rescue! We are trying occultation for our cover crop this year. This means that we till in the cover crop, then smother it with a black plastic tarp until it’s broken down by our magical bacteria and worm friends. This is another tip & technique from Bare Mtn Farm. We’ll see what happens - most years we end up battling the cover crop as a weed all summer, so we’re hoping that this will help us get more utility out of it as a green manure. Betsy and Mike at the Farmette just bought this amazing vintage '47 GMC, and we’re going to turn it into a roadside flower and food stand. I’ve heard so many good things from other flower farmers about this kind of direct selling, and how much money they make, that I just can’t wait to see how ours goes. Cute awning fabric is on the horizon! The tulips are up early, and the daffodils are not up at all! I must have planted the daffs too deep and the tulips too shallow. The tulips are also getting ravaged by deer and mostly squirrels. Our deer problem was really severe in the fall and over the winter, so we had to take that on. We repaired the fence by the mountainside, where most of them come in, and also set up a temporary electric fence on the wedding side - so far, they’ve kept out, except one night we did find footprints and some munched tulips, and the fence was really stretched out, like they’d run into it. This was probably our biggest pest problem and I’m so relieved to have it (knock on wood) solved. Also, our hoophouse looks like a cathedral in the early morning light, rudbeckia leaves are tiny and fuzzy and adorable, and I got a kitten. I love you, flower farming community! How is your spring going?